With a stay at Sandcastle Oceanfront Resort at the Pavilion in Myrtle Beach, you'll be on the beach, within a 10-minute walk of Myrtle Beach Boardwalk and SkyWheel Myrtle Beach. This beach resort is 2 mi (3.3 km) from Ripley's Aquarium and 2.5 mi (4 km) from Broadway at the Beach. Make yourself at home in one of the 241 individually decorated guestrooms, featuring refrigerators and microwaves. Rooms have private balconies. Complimentary wireless Internet access keeps you connected, and cable programming is available for your entertainment. Private bathrooms with shower/tub combinations feature complimentary toiletries and hair dryers. Enjoy a range of recreational amenities, including an outdoor pool, an indoor pool, and a lazy river. Additional features at this resort include complimentary wireless Internet access and a picnic area. Satisfy your appetite at the resort's coffee shop/café. Relax with your favorite drink at the bar/lounge or the poolside bar. 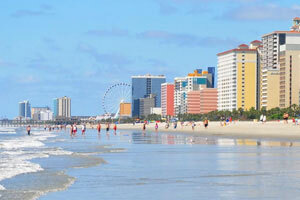 The preferred airport for Sandcastle Oceanfront Resort at the Pavilion is Myrtle Beach, SC (MYR).